James “Caroll” Claude, 76, of Woolstock, Iowa, passed away unexpectedly on Saturday, January 26, 2019, at his home. James Caroll Claude was born on May 10, 1942, in Woolstock, Iowa, the son of James and Enid (Doolittle) Claude. Caroll graduated with the Webster City High School class of 1960. Following high school he served in the United States Army National Guard until his honorable discharge in March of 1964. He then furthered his education at St. Ambrose University in Davenport earning a degree in accounting. On June 19, 1965, Caroll was united in marriage to Anne Claude, the love of his life, at the Church of Christ. Their marriage was blessed with two daughters: Elaine and Rochelle. Caroll and Anne lived in Eldridge, Iowa, and later Pekin, Illinois, where he worked as an accountant at Caterpillar, Inc. In October of 1998, the couple retired and built their current home in Woolstock. 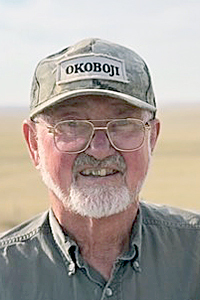 Caroll enjoyed hunting & fishing, woodworking, vegetable gardening, and spending time with family. Survivors include two daughters, Elaine Claude of Solon, Iowa, and Rochelle Claude Kotar and her husband Brad of Solon, Iowa; four grandchildren, Macie, Neva, Coltin (Steve), and Nash; one brother, Bryan Claude; three sisters, Jeanone (Russ) McClure, Marlys Caquelin, and Ellen Stanley; and several nieces and nephews. He was preceded in death by his parents, wife, Georganne “Anne” Claude, sister, Virgene Young, and brother-in-law, Jim Caquelin. Caroll’s family finds comfort knowing that he has been reunited with Anne, and is now at peace.